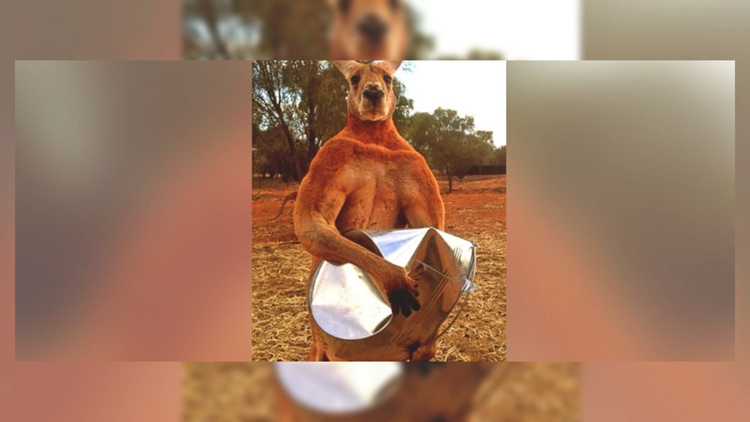 Roger the kangaroo crushes steel in the viral photo that made him famous. The photo was so amazing, some people even questioned its authenticity. (ABC News)--Roger the 'roo recently had a major moment of Internet fame when a photo of the muscle-bound kangaroo crushing steel went viral. Turns out Roger lives at The Kangaroo Sanctuary, a 90-acre wildlife reserve in Alice Springs, Australia. He was rescued by his "dad," Chris "Brolga" Barns, the star of “Kangaroo Dundee,” as a joey in 2006. Brolga found Roger in his mother's pouch on a highway. His mom had died. Roger's trained in hand-to-hand combat. And he's pretty tough, even when it comes to the man who saved him. Male red kangaroos have the natural instinct to kick-box because they fight with other males in order to become alpha male who then mate with female kangaroos. Roger also views Brolga as competition just because he too is a male. Roger will try to kick-box Brolga, although he isn't successful. But Roger has a softer side. Here he is cuddling a stuffed bunny. But it's said that after the photo was taken he threw the bunny to the ground and tried to kick-box it, too. Twenty-five kangaroos live at the sanctuary, but being a social media star has led Roger to be the main attraction, bringing visitors from all around the world to get a glimpse. It's hoped that Roger's star power will lead to an increase in donations for the sanctuary, as Brolga hopes to build a wildlife hospital on its grounds.